Receiving Amelia's diagnosis was a long process. I had my first appointment with the OB/nurse on May 11. Because of our history with Hope (who had Trisomy 18) we opted to supplement our OB visits with a couple ultrasounds at the Sparrow Perinatal Clinic. We did this during my pregnancy with Hannah and had a good experience. The first step with them is an early ultrasound at 12-13 weeks to do some nuchal measurements. I don't know exactly what these are but involve measurements of some neck tissue that can only be taken at this early stage in pregnancy. We had this appointment on or around June 12. I am 37 years old so I have my age and history working against me. Dr. Roth told us after the ultrasound, however, that based on the measurements the chances of this baby having a chromosomal abnormality went down from 8 in 1000 (age related) to 1 in 1000. We had no reason to be concerned. We decided to go ahead and do the blood work that Dr. Roth recommends even though the nuchal measurements came back so favorably. The first blood draw took place a day or two after the ultrasound and the second was 2 or 3 weeks later I believe. In July we went to Colorado for a family reunion with Mike's family and really didn't think about it at all. The last full day of our vacation (July 16) we were driving in and out of cell service on our way to Mesa Verde National Park and my phone rang. I didn't get to it in time, but saw that it was Dr. Roth's office calling so I told Mike to pull over (so that we didn't leave service) and I listened to the message. It was Dr. Roth himself calling. That got me suspicious (slightly alarmed) so I called back. He informed us that the blood work came back indicating that there was greater than a 1 in 2 chance for Trisomy 18. I didn't feel devastated or even particularly grief stricken. I just felt heavy and weighed down the rest of the day and for the next several days. Our extensive ultrasound was scheduled for the following Tuesday, July 24. In the meantime we had notified our families and asked for their prayers in the baby's behalf. I remember driving to the appointment with Mike and he was talking about anything and everything except for the upcoming ultrasound. We both were dealing with it with some borderline avoidance. The ultrasound went fine. Dr. Roth informed us that she did, in fact, have choroid plexus cysts on the brain, some issues with the blood vessels in the umbilical cord and some delay in growth. All of these by themselves were not causes for great alarm but taken together could definitely point to Trisomy. (That was the exact thing we were told with Hope.) 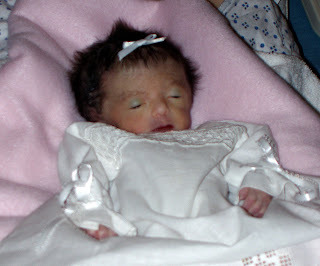 The symptoms, gratefully, did not seem as serious as Hope's (her heart condition was pretty severe, I believe), but I was resigned to the fact that she had Trisomy 18. We went ahead and had an amniocentesis immediately following the ultrasound. We were told that the initial results of the ultrasound would come back in 2-3 days. These were some preliminary results that while typically very accurate were not the definitive final answer. Because Dave and Kaye were in town Mike and I had scheduled a weekend getaway in Ohio. On Thursday, the 26th, I arranged my schedule to make sure I'd be able to take the phone call indicating that our baby had Trisomy, but the phone call never came. On our way to Ohio on Friday, Mike and I decided that we had better call them. We left a message and got a call back an hour or so later. It was the nurse! She told us that the results of the FISH test came back negative for any Trisomy. For the first time I cried. Mike cried too. We were absolutely shocked. Shortly thereafter I suggested we name the baby Amelia Grace. We both liked it. Our weekend getaway was wonderful! We had such a good time and were elated to hear that our baby was OK. The following Wednesday (August 1) I was at the zoo with the kids and a friend. My phone rang and it was Dr. Roth's office. I was too nervous to take it (and didn't feel like it was the right time and place) so I let it go to voice mail. A while later (still at the zoo) Mike called. I told him that they had called and I agreed that I'd listen to the message and call him back. When I listened to the message, it was Dr. Roth. That was not a good sign. Mike and I called him back a little bit later on a conference call and we got the definitive answer that the baby does have Trisomy 18. He apologized for the up and down of the diagnosis, but acknowledged that while rare, it does sometimes occur that way. We were blessed and taken care of by Heavenly Father the first time around and I know that He will bless us again. Perhaps the first thought is not the greatest, but it was real and honest. The second thought was no less real and honest. As much as I didn't want to deal with another Trisomy baby, birth and death, I knew that I was a better person for having experienced little Hope's life and death. Because God is unchanging I knew that I could expect the same with Amelia if I exercised faith, turned to the Savior and trusted in Him. On August 9, immediately before we left for Ohio for Amy's graduation, Mike and I went in for a consultation with Dr. Roth. It was a good meeting. We informed him that we did not plan to terminate the pregnancy. He told us that he didn't think that we would. As we talked, he (knowing we had connections to Utah) asked us if we were Mormons. He told us about working with another LDS family years ago and the impressions that they had made on him. It made both Mike and I feel good that he associated us with the church in a positive way. From that point on, we worked ourselves and with our children to try and prepare the best we could for the uncertainty of Amelia's birth and likely passing. There were certainly good days and very difficult days. We hope for and prepare for the best possible outcome and we also prepare for the outcomes that we would not choose. In all of it, though, we strive to trust in Heavenly Father - that "all things [are] done in the wisdom of Him who knoweth all things" (Book of Mormon, 2 Nephi 2:24).